Arcade Fire fans who are majorly bummed that they can't make either of the band's two shows at New York's Madison Square Garden next month needn't fret - the Quebec-based indie icons will stream the 5 August gig live on YouTube. 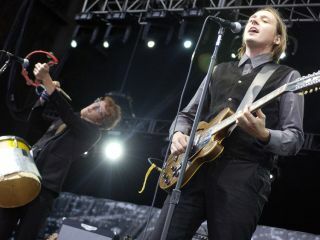 Arcade Fire are promoting the event with a new video trailer, as seen above. The clip features a snippet of a previously-unheard new track, Rococco, which will be found on their upcoming third album, The Suburbs. Win Butler and Regine Chassagne, the band's married co-leaders, appear as puppets in the trailer, which was directed by Clyde Henry (this conflicts an earlier rumor that it was to have been directed by Spike Jonze). According to reports, the YouTube webcast will be directed by a "a well-known, as-yet-unnamed luminary." Whether or not Jonze will be helming the project remains to be seen, but as the show is but a few weeks away, we'll know soon enough.